There does seem to be a blog war these days on the science-relgion conflict. There even seems to be a debate within the separate camps about the tactics used by the participants. And then there are other’s who find the whole issue embarrassing. They seem to wish everyone would just shut up or cover their ears (eyes and mouths). It’s worth asking, though, who is responsible? Who is feeding the conflict and why? The answer is no, of course. And that tells you something. By the way, this was a great talk. He was in great form, using a lot of humour to discuss recent findings in astronomical physics. He was speaking to the Commonwealth Cub in California on his book Death by Black Hole: And Other Cosmic Quandaries . His talk is available as a video (mp4), in audio (mp3) and as a Transcript (pdf). Well worth watching, listening to or reading. 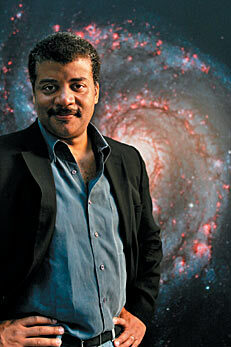 See Video: FORA.tv – Neil deGrasse Tyson: Death By Black Hole. This entry was posted in belief, Christianity, creationism, culture, diversity, evolution, faith, intelligent design, politics, religion, science, supernatural, superstition, theology and tagged Black Hole, Christian apologetics, Death by Black Hole: And Other Cosmic Quandaries, Neil deGrasse Tyson. Bookmark the permalink.